Handy Jack Gets New Name! I am inspired to rechristen the nightmare generating miscreant encountered in electrical repair! I have decided to refer to Handy Jack as The Handy JAbberwoCK in recognition of his most dread nature. I have always admitted I was slow on the draw, but it just recently [January 2016] came to my attention that Kidde had issued a recall of some smoke detectors and a combination smoke and CO detector manufactured from the end of 2013 to May of 2014. I came across the recall notice by accident while following a link related to another interest. The reason this drew my attention is that the device recall dates were from a period in which I installed a number of these devices. The supply house I bought them from was unaware of the recall and was surprised by my inquiry. Please note that certain identities have been obscured to protect me from the wrath of the guilty. I have been a Philadelphia Licensed Electrician since 1979. I was a Philadelphia Licensed Electrical Inspector from 1987 until 1994. I still answer questions on All Experts.com! They have disclaimers attached, and some of the electrical advice I read is still absolutely frightening! People who claim to be skilled professional electricians don't always know what they are talking about! The DIY sites are even scarier. Read what is offered in these sources, but check to make sure what they say is right. You are your own ultimate quality control expert. Control the quality of the advice you follow, or risk the consequences! Now comes the scary part that motivated this newest post. I recently was called to install a GFI receptacle at an existing kitchen location to satisfy a home inspector so a home could go to settlement. What I found was a nightmare. In 2000, a retired widow bought a little condo in a high-rise to enjoy a stress-free residence. She had the apartment decorated and the kitchen remodeled to her tastes. She hired a licensed general contractor, who hired a "professional" electrician. The Township in question [TIQ] required that the electrician be licensed. The electrician was licensed. The TIQ required a permit. The electrician had a permit. The TIQ required third-party inspection. A licensed inspector inspected the rough wire and the completed work. Can anyone explain to me how a homeowner can hire a contractor who is licensed [and therefore supposedly skilled] and gets a permit to install wiring, has an inspection performed by an underwriter and nobody is responsible when an installation is found to be substandard because numerous defects are discovered during the new buyer's homeowner inspection when the house is sold fourteen years later? I asked my insurance agent about the risk accepted by the contractor's insurance company under a liability policy and how long is it in force. The insurance company does not take on any liability. An insurance policy does not cover poor workmanship. If the poor workmanship caused a fire, then the insurance company would pay for the damage caused by the fire. This is assuming the fire occurred within 7 years of the performance of the work. Seven years is currently the standard of time before the contractor is no longer responsible. The inspection agency [the one that performed the inspections] says that an inspection is only valid for one year. The argument is that the now deceased 70 year old homeowner (little old lady) might have ripped open the tiled wall and modified the wiring she hired the contractor to install. I have no idea what the position of the inspector's insurance company is. I can guess. I asked the TIQ. They keep records for four years. License, permit, inspection report - trash. "That is a civil matter!" The inspection agency in question is still authorized to inspect in the TIQ. Home Improvement Contractors are now required to register with the Attorney General's office. I suppose it is because of all the con artists "painting" driveways, absconding with deposit money or charging two million dollars to replace a sewer line. "PENNSYLVANIA HOME IMPROVEMENT CONSUMER PROTECTION ACT"
"The official registration number of Robert Wilber can be obtained from the Pennsylvania Office of Attorney General's Bureau of Consumer Protection by calling toll-free within Pennsylvania 1-888-520-6680. Registration does not imply endorsement." The AGs office said basically that it sounded like a civil matter and they hadn't received a complaint anyway. I have suggested the victim's daughter file a complaint with the PA Attorney General's Office. I thought that they might take an interest in that one might expect the statute of limitations to start at discovery, rather than at the time of the bad act. Improper installations can cause fire, injury and death! Philadelphia Cancels Safety Inspections, Cripples C&I Fire Unit. I don't know whether I would have written about this except for the recent building collapse on Market Street. Everyone is talking about Mayor Nutter and L&I on the radio. They talk like it was a conspiracy. It isn't. It is just the same old bureaucratic maze. People have little jobs doing little things the same way over and over. A lot of things just aren't anyone's assignment, or there are so few people to do so much that it can NEVER get done. There have got to be ten thousand places to eat in Philadelphia. Just how many health inspectors can we afford to pay for, anyway? Say there are, how many involved? Ten? Twenty? With supervisors, and trainings and paperwork and cars and offices and reports...and what do they get paid, thirty thousand a year? So we spend two million dollars a year on it. ...and these fifteen inspectors get to go into the office and spend at least three hours a day on rote office operations, then breaks and lunch and getting started and shut down and organized to do something. There goes another two hours. Apiece. That leaves three hours a day to inspect - you think I'm kidding? Get a car, put it away, gas it up go somewhere, leaving an hour and a half for inspection, half of which gets spent on paperwork and phone reporting. So each inspector gets to one place a day each, if they are lucky. And one day a week they have to meet with supervisors. So maybe 60 places get looked at each week for less time than it takes to eat lunch. Vacations, holidays ... maybe two thousand places get inspected each year, in the most cursory way possible. That means, with any luck, it takes five years for a restaurant to get inspected. When you consider that 90% of new businesses close in less than a year, it means that an inspector NEVER looks at where we eat! This is just to give an example. What I really want to talk about is emergency lighting, you know the little spotlight heads all over the place in all the stores that are supposed to light up when the power fails, the exit signs that show where the door is in the dark or a fire? How many times have you been somewhere where the power failed and the emergency lights didn't work? A lot, I bet. The reason is that people don't check them....and they don't know they don't work until the lights go out and the emergency lights don't come on. These systems should be checked every month, and tested to make sure they operate long enough once a year for an hour and a half. A log book should be kept showing the test and the result of the annual test, but most people don't keep one. The City of Philadelphia required an annual inspection, test and certification of exit and emergency lighting by a licensed contractor. The certification was sent to the C&I [Commercial & Industrial] Fire Unit at 900 Spring Garden Street. This meant that at least that one time each year, the emergency systems were checked by someone qualified and maintained in working order. I just found out that Philadelphia cut the L&I budget by one third a couple of years ago, discontinued that requirement and moved the C&I inspectors from Spring Garden to the local district offices, where they now perform any and all inspections, leaving this critical function in the hands of store owners and landlords. Why doesn't my electricity work? I receive many inquiries from people about their electricity not working. I like to help, but the possible cause of problems can be drawn from so varied a list that it is nearly impossible to provide a useful response. The following is a perfefct example. I live in a 100 plus old six unit building in DC that--like many places--is staggering under the demands of modern devices. This has caused the occasional interruption with toaster oven plus space heater combo...nothing that can't be fixed easily and then thrown back on with the circuit breaker switch. This week, however, it seems the whole thing expired. In one whole half of my apartment, no lights come on DESPITE the circuit breaker being clearly in the "on" position. In fact, it never flipped into the red "off" side. I've switched it back and forth a handful of times in the hopes that I can activate something, somehow, to no avail. My unit has not been rewired completely ever, to my knowledge. a few outlets no longer work, but this is the first time half the building has gone out. Each unit controls its own lights, room by room in the circuit panel, however there is a big box in the basement for the building, although when I checked it out, there was no labeling that indicated it controlled anything in individual units. There are near endless possible causes. In short, anywhere there is a connection, a device or a current limiter of any type there may be a failure, or an open caused by a properly functioning safety device. The homeowner just didn't want a permit! "Thank you for considering providing an opportunity to be of service. I can appreciate your position regarding the coercive nature of the requirements set forth, nor do I disapprove of your views in the least. Even so, licensing and permit processes are established in the tenor of offering a guarantee of, at worst, minimally qualified personnel providing, at the least, minimally adequate code compliant installations. The establishment and adoption of these standards by the municipality authorizes substantial penalties for both the owner and installer should they elect to evade the permit process, if discovered. This system is intended to secure the safety and peace of mind of yourself and your family. If an unfortunate situation resulting in a loss should develop from improper wiring, an unlicensed installer may not be insured and your own insurance may reject a claim. Unfortunately, as a licensed electrical contractor, I cannot lightly overlook the impact of these obligations and the potential consequences. Though you would be paying the fees, I will be the party interacting with the township. Please feel free to call if I may be of any assistance. Don't just reset tripping breakers! I received an inquiry today from someone with a tripping breaker. Was the whole neighborhood out? Did the breaker trip during the outage? ...or after power was restored? ...or was it the cause of the outage? Does the breaker trip if everything is unplugged from the circuit? 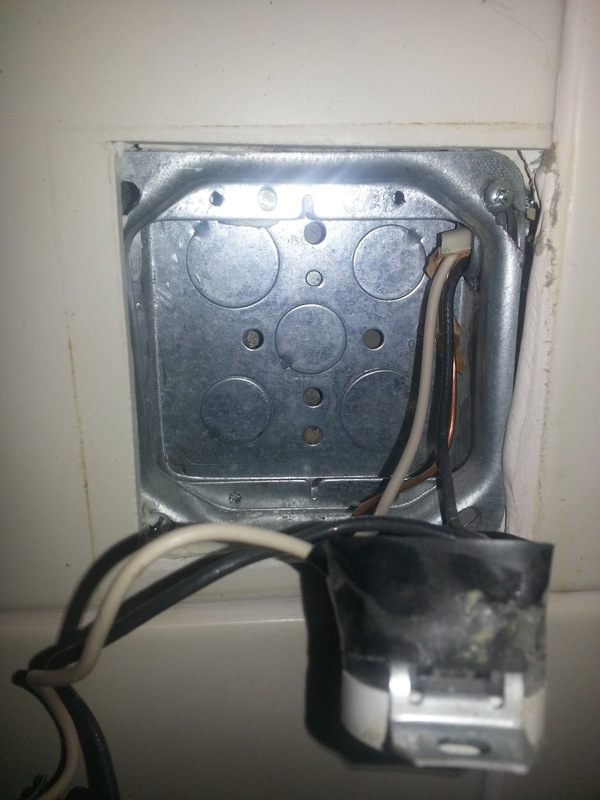 Why do you keep resetting the breaker if you haven't isolated the cause? A circuit breaker is NOT a repair device. Continuously resetting the circuit breaker and closing it on a fault is not going to fix the fault! ...but it might start a fire! It is like continually striking a match in the same place! If you can't determine the cause call a qualified electrician. If you live in the Philadelphia area call a licensed Philadelphia electrician! Licensed Philadelphia PA electrician learns undiscovered historic L&I electrical violations pass through sale to new owner. I just received a call from a property owner in Philadelphia. Anyway, L&I comes and does what they are required to do, by law. Lo and behold there are violations! The biggest problem? A previous owner had the electrical panels changed and several circuits installed ... but they had the electrical work performed by an unlicensed individual, with no Philadelphia electrical permit and no third-party underwriter's inspection. It is apparent the materials involved in the work were not available at the time the house was originally built! ... and there is no inspection sticker at the panel location! It doesn't matter that the work was done before the new owner purchased the property. The obviously illegal wiring has just now been revealed and the building is in violation. The new owner is subject to substantial DAILY fines until a permit is obtained and any defects in the illegal installation are corrected by a Philadelphia licensed electrician. Licensed Philadelphia Electrician frightened by homeowners! ELECTRICAL RULE NUMBER ONE - ELECTRICITY IS DEATH IN A BOX! NEVER ASSUME ANYTHING! EVER! People never cease to amaze me! I have been a licensed Philadelphia electrician for thirty of the thirty-five years I have worked as an electrician. I have been told I am not a patient man. I don't think that just because I do not suffer fools gladly it means I am impatient! I keep thinking "Now I have seen everything." ... and yet, I receive unending gospels of blatant ignorance and poor judgement! I recently developed what I thought was a blown breaker in our family room. Upon further inspection I noticed that not only was the breaker for that room not triped but that there was no circuit wired to it at all! Further inspection revealed two wires conected to the above breaker (Arc fault) for a different room. The black wire I have determined is for the room associated with that breaker. 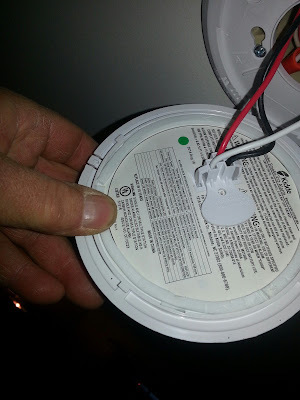 The red wire however does not seem to associate with any other circuit in the house as it doesn't seem to matter if it is connected or not. I can only assume that that is the wire for the susspect circuit that is without power. 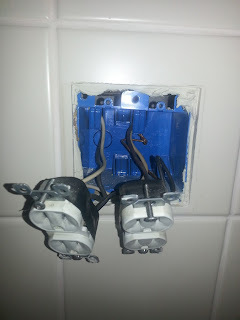 All breakers are Square D homeline series and the house is wired with Romex (no pipe). I have checked the wiring from the pannel to the atic for physical damage and there is none. If my assumptions are wrong about the Red wire doubled up on the above breaker then I am just chasing my tail. I have connected this wire to the breaker for the faulty circuit and it has not made a difference. When the fault occured I was home and it acted just like a blown breaker. All the power for the family room was killed. This circuit also supplies power to the lights in two other rooms. I apparently have an open in the circuit and I can't seem to find it. I have metered the panel and I have 125VAC to all circuits in the panel. I have also metered most of the recepticals, light switches and fixtures and I have no power to any of them, not even residual. I have run out of ideas and I am quickly running out of patience. Our home is only 7 years old so it does not make sense that corrosian or a failed fixture is the problem. Any ieas you have would be greatly appreciated. Thank you. Let me apologize in advance, because you are about to be insulted. JUST WHAT WERE YOU THINKING? 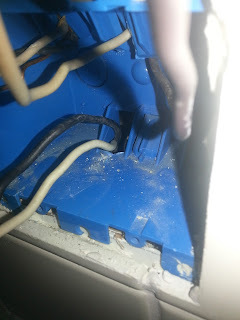 You find a wire in your panel that is obviously intentionally NOT connected [you have not indicated that there was evidence that the conductor material failed and broke] and YOU GO AND ENERGIZE IT WITHOUT FINDING OUT WHERE IT GOES? DID YOU THINK GREMLINS CAME IN DURING THE NIGHT AND DISCONNECTED IT TO TURN YOUR LIGHTS OFF? YOU ARE LUCKY YOU DIDN'T KILL SOMEONE! Now, to your electrical problem. You said: "When the fault occured I was home and it acted just like a blown breaker. All the power for the family room was killed." How do you know it was a "fault?" A fault is a very specific electrical condition. It describes the intentional or unintentional electrical connection between two conductors of differing potential. Is that indeed what occurred? Or did the circuit just go "dead?" Or do you mean that electrical devices just do not work at outlets on the circuit anymore? You say there was no wire connected to the breaker labeled for the circuit that went out. I DON'T CARE WHAT THE MORON WHO WIRED YOUR HOUSE WROTE IN YOUR PANEL! IF THERE WAS NO WIRE CONNECTED, THAT IS NOT THE POWER SOURCE FOR THAT CIRCUIT! What kind of "residual" voltage did you expect? Are there capacitors in the circuit? Do you think electricity pools at the lowest point like water? You said: "Our home is only 7 years old so it does not make sense that corrosian or a failed fixture is the problem." Why doesn't that make sense? The fact is that, if all the circuit breakers are allowing power to their terminal screws and no other intentionally installed safety device intervenes, then the only remaining option is that the circuit is interrupted somewhere else DUE TO EQUIPMENT FAILURE! 3] the circuit neutral conductor is open because it is suffering from any of the same causes. An unhappy fact: the device where the power interruption exists may be functioning properly. The feed-in connection may be intact. The feed-out connection may be damaged, burned, etc. - especially common in the case of receptacles connected with push-in "speed-wire" terminals. Turn breakers on and off. The circuit with only one or two functioning devices is probably your culprit. Draw out your house floor-plan and mark device locations. Map out the circuit. Look at what works and doesn't work. Look at where the panel is. Think of the house without sheetrock. Consider John Glenn's story about being in a spaceship built by the lowest bidder. New houses are all lowest dollar installations. Wire and labor cost a contractor money. How would it have made sense to run the circuit conductors? Your problem is at the beginning of the circuit, not the end! TURN THE POWER OFF WHEN WORKING! This information is provided for the use of parties as they see fit! I am not responsible for the application of this information by any party, including those lacking sufficient skill or knowledge to perform these steps safely and any hazard created is the SOLE responsibility of the user.